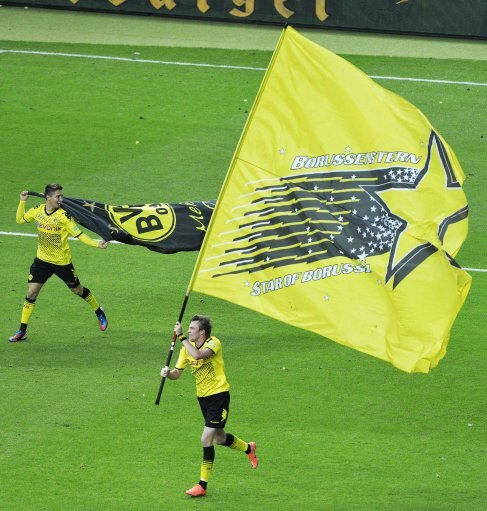 A couple in the German town of Hemer are taking their next-door neighbours to court over the ear-splitting noise created by the Borussia Dortmund flag they have fluttering in their garden. Local Dortmund newspaper Der Westen have identified the couple as “Jutta and Walter H”, who told the paper that the sound of the BVB flag flapping in the wind on the other side of the fence disrupts them from reading their books next door. “I couldn’t care less what is hanging there, it’s a nuisance,” Jutta H told Der Western, with her 62-year-old husband admitting that the complaint is nothing to do with team allegiances, despite him being a Duisburg fan. Walter H told the paper that he hadn’t been to a Duisburg game since the 1970s and that his problem with the flag is “only about the inconvenience” it causes. A spokesman for Arnsberg administrative court has said that the case is unlikely to go to court until summer at the earliest. We’ll endeavor to keep you posted on this one. Dortmund themselves have, quite rightly, declined to get involved.